The CSRS Voluntary Contributions Program (VCP) is a special component of the Civil Service Retirement System. While the CSRS VCP program was originally designed to allow CSRS to put more money in and buy an additional retirement annuity, the big deal about the CSRS VCP program these days is that you can use it to max-fund a Roth IRA. This is a fantastic benefit for CSRS, especially CSRS who thought they made ‘too much money’ to have a Roth IRA. Few people have even heard of the VCP, let alone know how to use it to max-fund a Roth. That’s why I call the CSRS Voluntary Contributions Program the best kept secret in CSRS. In the book, I cover everything you need to know about the VCP and give you step-by-step instructions how to transfer money from the VCP to an IRA. But first, I want to answer some basic questions about the CSRS Voluntary Contributions Program. If you still want to know more, then we’ll talk more about what’s in the book. The CSRS Voluntary Contributions Program (CSRS VCP) is a special benefit only for CSRS and CSRS Offset federal employees. It is not available for FERS. It’s a very unique benefit, and there is no comparable program in the FERS system. If you meet certain qualifications (and most CSRS do) you can open a VCP account. The money you put in is after-tax (not tax-deferred like your TSP). That money earns a small amount of interest that will be taxed later. How Much Can You Put into the VCP? If you are eligible for the VCP, you can put up to 10% of your aggregate base pay into your CSRS Voluntary Contributions account. This is 10% of your accumulated base pay over your ENTIRE CSRS work history. And if you’ve been working for the Federal Government for a long time – this could be quite a large amount. And you can contribute money to your VCP over your career, over several payments, or even with just one big check close to retirement. For easy numbers, let’s say you made $50,000 of base pay every year for 20 years as a CSRS. Now of course, your base pay will have changed over the course of your career – but we’re using round numbers to highlight the concept. In our example, you would be able to contribute… (10% of $50,000) = $5,000 … $5,000 x 20 years = $100,000. And in this case, $100,000 is your maximum contribution limit. You could contribute any amount up to your limit (as long as it’s in $25 increments). So if you only wanted to put a total of $40,000 in your VCP, that would be your choice. And with your VCP – you could be putting money into your VCP little by little over your working career – or write one big check right at the end before retirement. So you can see that even though you are limited in your contributions, the limit is pretty darn high. And the higher your basic pay has been over your career, the higher your limit will be. In the book, we discuss the contribution limits for the VCP in much more detail. And we also discuss ways to help you figure out your personal contribution limit. What Can I Do With My VCP? So once you fund your VCP, you can choose the VCP annuity at retirement. Or you can withdraw your money at any time before retirement and transfer it to another account, like a Roth IRA. But you can’t do both – it’s all or nothing. You either use all of your VCP money to buy the VCP annuity, or you transfer it out to another account. When you retire, you can choose to buy a VCP annuity. The annuity amount you receive will be based on your account balance at retirement. When you buy the VCP annuity, you’re trading in the entire CSRS voluntary contributions account balance in order to receive a certain amount each month as long as you’re retired. We cover the VCP annuity in much more detail in the book, including some important things you need to know. For example, we talk about how theVCP annuity you receive will be partly taxable. Recall that your voluntary contributions were after-tax, but the interest it earned was tax-deferred. Since there was a mix of after-tax and tax-deferred money in your VCP account when you traded it in for the annuity, a portion of each payment you receive in retirement will be taxable. In the book, we also talk about how the VCP annuity does NOT get increased by COLA. It will be the same amount for as long as you are retired. And we also cover the important survivor considerations – you need to know that the survivor options on the VCP annuity are very differentfrom your regular CSRS pension survivor choices. So the VCP annuity is an option – and we do cover it in the book. But by far, the most popular thing to do with a VCP is to withdraw it before retirement or at retirement. You have the option of withdrawing your CSRS voluntary contributions at any time before retirement. Catch #1) If you withdraw your VCP, you must withdraw everything. You can’t take a portion, you have to take it all. Catch #2) Once you withdraw money from your VCP, you can not open another account again. You only get one shot at the VCP. Can You Still Do a Roth Conversion in 2019? Yes, as of 2019, there are still no income limits on *conversions* to Roth IRA accounts. Technically, the income limits on Roth conversions were repealed as of 1/1/2010. As it stands, there is no set date for the income limits to return. But the tricky thing about tax laws is that they are in effect… until they’re not. Congress has the ability to bring back those limits whenever they want. But as of 2019, there are still income limits on *contributions* to Roth IRAs, but there are no income limits on *conversions*. Before you do anything, make sure you understand all of your CSRS Voluntary Contributions options. Even though you may be most interested in the VCP-Roth transfer, it makes sense to understand how the VCP annuity works. The more you know, the better decision you’ll be able to make. That’s why we cover the VCP annuity and all of its options in the book, as well as the VCP-Roth transfer. Changes to the tax laws in 2010 opened up a special opportunity for people who used to make ‘too much money’ to have a Roth IRA. While there are still income limits on who can *contribute* to a Roth IRA – there are no longer income restrictions on who can *convert* money from another qualified account to a Roth IRA. The CSRS Voluntary Contributions program is a very unique benefit. Because it is so unique it can be difficult to find good information on the program. I’ve even had people tell me their HR person told them the VCP didn’t exist. If you want to use the VCP, you’re going to need to make sure *you* have all the right information to make the best decision for your personal situation. Looking for One Resource With All of Your VCP Answers? It can difficult to sift through all of the information out there. If you’re looking for one place to go to learn about all of your VCP options, you’ll enjoy ‘The Best Kept Secret in CSRS’. You’re a CSRS or CSRS Offset federal employee who wants to know more about the VCP. You’ve been looking for information on the CSRS VCP, but still want to know more. You want to understand all of your CSRS VCP options before you just jump in and do a transfer. You’re financially fit and have been saving money for retirement. You want to put more than $7,000 a year into your Roth. 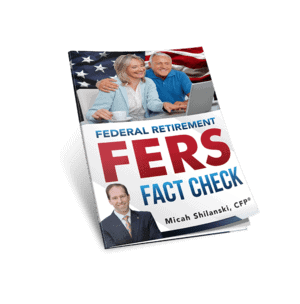 Don’t buy this book if you’re a FERS. The VCP program is only for CSRS and CSRS Offset employees. FERS don’t even have the option to do the CSRS VCP. Don’t buy this book if you don’t have more than $7,000 to put move into a Roth. The CSRS VCP to Roth transfer is a great way to max-fund a Roth. But if you don’t have any money to move into the CSRS VCP, this book isn’t for you. If you only had $1,000 to put in the VCP, it’s probably not worth your while. And if you qualify for a Roth IRA, just stick the $1,000 directly into the Roth. If after you read the book…you feel it wasn’t worth it – I want to give you your money back. If you feel it was a waste of time, I want to give you your money back. If you didn’t learn anything new, I want to give you your money back. If you found another book you liked better, I want to give you your money back. If you find you just couldn’t apply the information to your personal situation, I want to give you your money back. I’m listing out reasons here – but if you’re not happy with the book for any reason within the first 6 months after you buy it, I want refund the full amount you paid for the book. And I’m not going to hassle you about it either – just send me an email and I’ll refund the price you paid for the book. So go ahead, buy the book. I’m confident that you’ll find it to be a very valuable resource. And if you don’t – I’ll refund your money. You have nothing to lose.